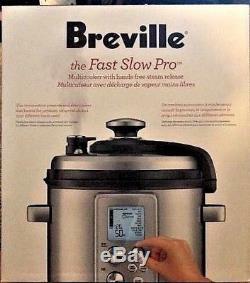 Brand New in Original Box Breville BPR700BSS The Fast Slow Pro Multi Cooker Silver 6 Quart. 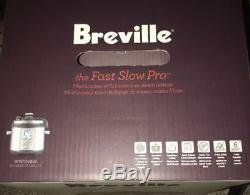 Countertop cooking gets even easier with the Breville Fast Slow Pro. This combination pressure cooker/slow cooker eliminates all the guesswork automatically adjusting pressure, temperature and time depending on what you're cooking. Hands-free steam release ensures top flavor and texture, whether you're speed-cooking or slow-simmering. Preprogrammed settings include pressure cook, slow cook, steam, sauté, sear, reduce and keep warm. Hands-free, automatic steam release for extra safety. Dual sensors monitor ingredients for more accurate pressure/temperature control. 11 pressure cook settings plus a custom setting to suit your favorite recipes. Slow cook settings: select HI or LO from 2 to 12 hours, plus a custom setting. Includes stainless-steel steamer basket and rack. 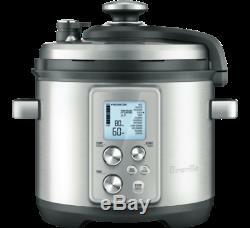 Pressure, temperature and time automatically adjust between pressure and slow cooking. Color-changing LCD tells you when cooker is pressurizing, cooking or releasing steam. 3 steam release modes: Auto Quick, Auto Pulse and Natural. 8 pressure levels from low (1.5 psi) to high (12 psi). 3-Way Safety System includes safety locking lid, automatic hands-free steam release, safety valve. Keep Warm function turns on after cooking, so food is ready to serve when you are. Removable cooking bowl with PTFE- and PFOA-free ceramic coating. Wide, wraparound moat catches condensation and food spills. This product is intended for use in the United States and Canada, and is built to U. The item "Breville BPR700BSS The Fast Slow Pro Multi Cooker Silver 6 Quart NIB" is in sale since Wednesday, November 21, 2018. This item is in the category "Home & Garden\Kitchen, Dining & Bar\Small Kitchen Appliances\Slow Cookers & Pressure Cookers". The seller is "bknoutlet" and is located in Manorville, New York. This item can be shipped to United States, Canada, United Kingdom, Denmark, Romania, Slovakia, Bulgaria, Czech republic, Finland, Hungary, Latvia, Lithuania, Malta, Estonia, Australia, Greece, Portugal, Cyprus, Slovenia, Japan, China, Sweden, South Korea, Indonesia, Taiwan, South africa, Thailand, Belgium, France, Hong Kong, Ireland, Netherlands, Poland, Spain, Italy, Germany, Austria, Bahamas, Israel, Mexico, New Zealand, Philippines, Singapore, Switzerland, Norway, Saudi arabia, Ukraine, United arab emirates, Qatar, Kuwait, Bahrain, Croatia, Brazil, Chile, Colombia, Costa rica, Panama, Trinidad and tobago, Guatemala, Honduras, Jamaica, Viet nam, Uruguay.